Cost to install a porcelain tile shower varies greatly by region (and even by zip code). 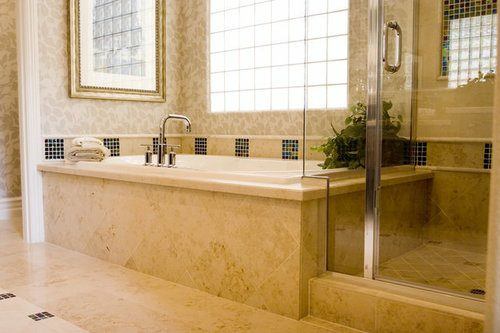 Get free estimates from shower door and enclosure contractors in your city. Cost to install a porcelain tile shower varies greatly by region (and even by zip code). How much does it cost to install a porcelain tile shower? Installing a porcelain tile shower can dramatically improve the look of your shower, especially if it is outdated or otherwise in need of being repaired or upgraded. A porcelain shower can be installed using some of the latest styles and patterns and it can add a substantial amount of value to your home. This is a job of considerable difficulty and, as a result, it is not a good option for a do-it-yourself project. It is fairly easy to make mistakes with a tile shower installation and correcting those mistakes can end up taking significantly more time than you expected, or you may have to hire a tile contractor to fix the mistakes. This guide gives an example of installing tile for a standard 36” x 36” shower with three walls and 8-feet-high ceilings, which can fit in a standard sized bathroom of 5’ x 8’. A 36”x36” shower with three walls and eight-foot high ceilings has approximately 80-90 square feet of wall and floor space that would need to have tile installed on it. 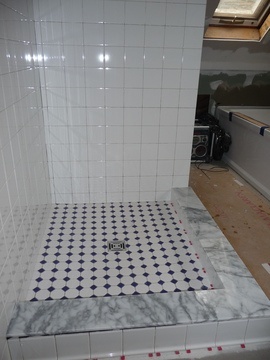 Tile contractors usually charge a flat rate per square foot of tile that needs to be installed. The rate is normally $10-$15/sq.ft. depending on the contractor’s experience. This rate includes laying the tile pattern, cleaning and grouting 1, and planning the project out, but it does not include removing any existing tile. For a 36”x36” shower, the labor costs for a tile installation would be $800-$1350. Basic porcelain tile costs an average of $10 per sq.ft. Material costs for porcelain tile for a 36”x36” shower will be $800-$900. Sealer and grout 1 need to be purchased, and for 80-90 sq.ft. the cost will be $100-$175 for grout 1 and $75-$150 for sealer. It is not common for a tile contractor to charge hourly, but if they do, hourly charges will range from $40-$60/hr. Installation a 36”x36” tile shower will take approximately two and a half days (20 hours), or $800-$1200, not including the removal of old tile. 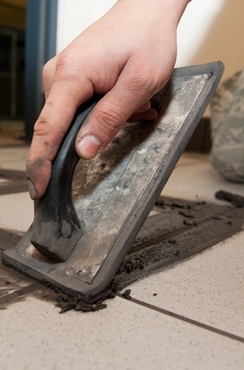 Removing old shower tile can take one full day and is usually charged at a flat rate of $320-$480 including disposal. The more decorative the pieces are and the more complex the pattern is, the higher the installation and material cost will be. Complicated patterns can add 15%-20% more to the total cost. Adding a new shower base 2 can cost anywhere from $150-$1000 depending on the quality desired. Updating outdated plumbing can add $500 to the total installation cost. Adding a cement backer board is a good idea for water damage protection and the cost is $50-$100 for materials and an extra $160-$320 in labor costs. Porcelain tile is generally more durable than ceramic which is why it is priced slightly higher, usually 10%-25% more. If there is a shower/tub combination, it can be more difficult to install in spite of the lower amount of square footage needed for the shower tile, which can add 10%-20% to labor costs. Buying the tile before hiring a contractor is recommended in order to save money and separate material costs from labor costs. How much does it cost to install a porcelain tile shower in my city? Cost to install a porcelain tile shower varies greatly by region (and even by zip code). To get free estimates from local contractors, please indicate yours.